On each trip to France, our family devotes the first few days to getting over jet lag, and that includes Chula, our 11-year-old Sheltie. Though scientists say that dogs are not as subject to jet lag as humans, we wonder why Chula, an experienced traveling dog, sleeps so much the first couple of days and why she is always there staring at us when we awake at 4 am! 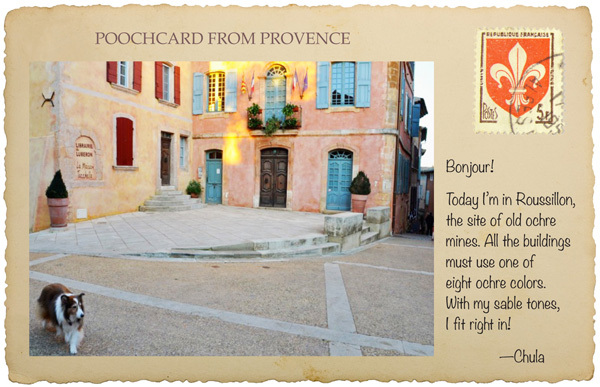 At some point, thankfully, the whole family is rested and ready to venture beyond our village, Saint-Rémy-de-Provence. That’s when we head to the Luberon Valley where some of the prettiest villages in Provence grace the hilltops. Heading up the south side of the valley, we pass through Maubec, Ménerbes, La Coste, Bonnieux, and end up in Saignon, a secret jewel at the east end of the Luberon. Chula loves the tranquil village of Saignon because it’s a pretty easy hike to the top, where a circular path then goes around a huge rock outcropping, called Le Rocher. From there, Bob and I enjoy the wide-open views of the entire Luberon Valley, but Chula would tell you this path is the best sniffing ground in all of Provence. Something for everyone! Back at the village, we stop in the beautiful square where Chula does more sniffing and finds some welcome fresh water set out for her at a nearby café. 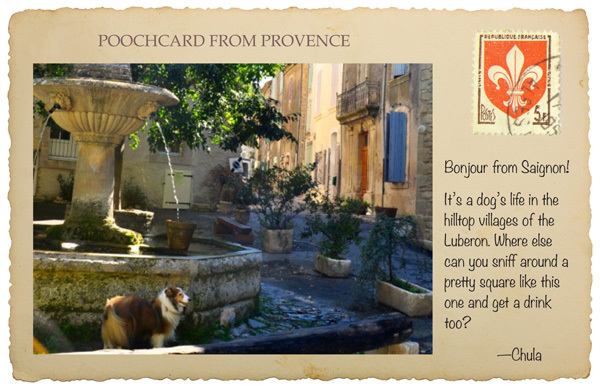 French words to know if you travel with your dog are Potable and Non Potable. Posted on every fountain in every village, these words tell you whether the water in the fountain is “drinkable” or “not drinkable”—an important difference for your pooch. We like to head home on the road at the north end of the valley so we can stop in the most colorful villages in Provence. In the village of Roussillon, all the homes and buildings must be finished in one of eight ochre pigments. As a sable Sheltie, even Chula complies with the color palette. The ochre mines around Gargas, Rustrel, and Roussillon provided pigments to the world from the late 1700s to 1930. Today, mining is prohibited, but visitors are welcome. Chula, Bob, and I never tire of stopping here to walk the colorful canyons. Only trouble is Chula gets the powdery dirt all over her. Her white rough turns red and her four white socks pick up every color of ochre from yellow to red to purple to brown! Next we head to Gordes, the granddaddy of all hilltop villages in the Luberon. Since the homes, fences, and public buildings must be made of stone, the village seems to add girth to the hill’s bedrock all the way down to the valley floor. A walk through Gordes requires stamina, but the effort is rewarded with keyhole views of village alleyways, stops in charming shops and galleries, and a visit to the old church whose walls are painted in Provençal patterns. Chula is always a little tuckered out after a visit to Gordes. That’s why we keep a supply of flat plastic water bowls in our car. Pull out their sides to form a kind of sailor’s hat, and Chula can get a drink right away. All these villages are a feast for our eyes. 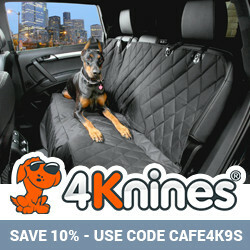 But, even for a traveling dog like Chula, three stops in one day add up to—dinner! We agree and head home so that Chula can enjoy her kind of French feast. Chula’s full-length book Dog Trots Globe covers her adventures in Paris and Provence, including an encounter with 3,000 sheep. Hardcover book available from OIC Books and Amazon, which also carries the standard eBook. Enhanced eBook with embedded videos and music available from Apple for iPad. Keep up with Chula’s continuing adventures on her Facebook page. Text and Images copyright © Sheron Long. All Rights Reserved. 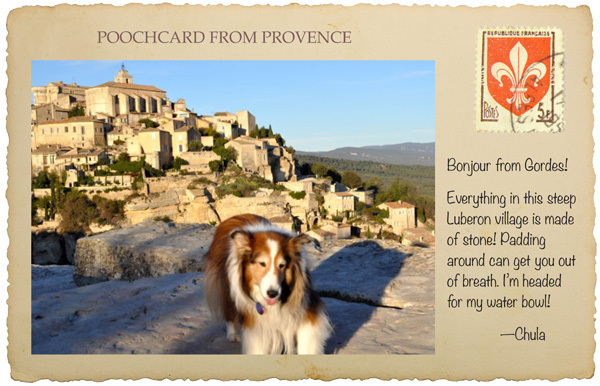 This entry was posted in Guest Post, Pet Travel and tagged Chula the Sheltie, dog friendly France, pet travel in France, travel with dogs on February 5, 2013 by Sheron Long.